I’ve observed its construction in the faraway distance from my kitchen window – a massive, flying-saucer-like building gradually pieced together by ant-sized workmen in hi-vis jackets, the new dominant feature on already eerily modernist Clyde-side. And as a music journo, I’ve pondered what’s waiting for me there. At The Hydro’s neighbours the Clyde Auditorium and the by-comparison now very dowdy looking SECC, I’ve had my fair share of sublime, strange and excruciating nights at work over the last ten years – from properly exceptional shows by Arcade Fire and Kanye West, to getting splashed by Kylie during her aquatic-themed Aphrodite spectacular, to feeling the glare of suspicious parents as the lone adult male stood among throngs of teenage girls at Little Mix or Katy Perry, and nearly chewing my arm off with boredom during three hours of Bryan Adams. But believe it or not, I’m cheerful about The Hydro landing – and not just because it’s good for my livelihood. More than that, I think it makes a big statement about Glasgow’s important position in the music world, and promises an improved experience for gig-goers who’ve been let-down by the previous alternatives for too long. The average List reader will no doubt shrug indifferently, and fair enough – for every one show by a Vampire Weekend or Queens of the Stone Age, there’ll be three by a Michael Bublé, Maroon 5 or Barry Manilow. It’s corporate sponsored, and let’s face it, it looks a bit daft (dafter still: its cheese grater car park). But I think you too should modestly welcome the Flying Saucer. Well, we call the Clyde Auditorium the Armadillo right? With the live sphere more than ever where the money’s at in music these days, Glasgow has done well to better equip itself for a competitive future and strengthen its overall status as a must-visit touring destination – a status as important to small venues as it is large. The Hydro’s 13,000 capacity plugs a big gap in the city’s live music facilities which has caused pop A-listers à la Beyoncé and Jay Z to miss Glasgow off their UK tours lately. Within five years it’s projected that it’ll become the world’s third busiest entertainment venue after only London’s O2 and New York’s Madison Square Gardens – some achievement for a city so small. There’ll be myriad positive knock-ons for the local economy (potentially £130 million a year’s worth), even if already over-inflated ticket prices are also set to rise (up to £125 a pop for Fleetwood Mac, ouch). But wouldn’t you rather pay a bit extra to at least see gigs in a venue optimised for purpose? Clyde Auditorium and SECC – not to mention the soulless Braehead – aren’t even dedicated music spaces but multi-purpose milieus considered as apt to hosting Nick Clegg’s keynote speech at the recent Lib Dem conference as they are, say, Alice Cooper attacking a girl’s steel chastity belt with an angle-grinder (another highlight from my gigs scrapbook). 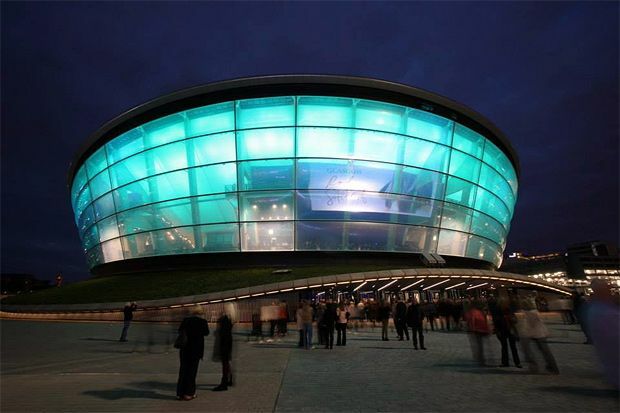 Boasting better sightlines and sound quality, The Hydro is not just the biggest venue in Glasgow purpose-built from the bottom up principally for live pop and rock music, but the only one period. Much as it’s never ideal to watch a band you love in such an impersonal enormo-space, The Hydro at least makes the best of modern arena reality. Malcolm Jack is a freelance music journalist and regular contributor to The List.